Humans understanding (or misunderstanding) other humans couldn’t be a bigger topic as the world gets smaller and the global population grows. One high school student looked at the abilities of elementary school children, from a mostly white community, to understand the facial expressions of other children of color. 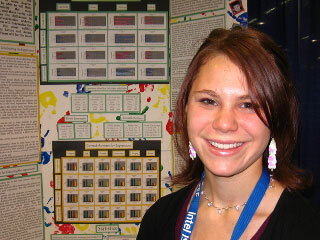 Brandy Buchanan is pictured in front of her booth at the Intel International Science and Engineering Fair 2007 in Albuquerque, New Mexico. PodTech’s Jason Lopez posted this podcast interview.